Crisp Fall Night? Warm Up Around the Fire Pit! Signs of fall are all around us! From the changing leaves, to the pumpkins, and from football to the many fall fairs and festivals, it is hard to deny that change is in the air. This change often brings with it a slight chill to the air, and many families find themselves huddled around a backyard bonfire for a little extra warmth and memory making. Hutcheson Horticultural Company has had the pleasure of helping families and individuals enjoy outdoor space with the installation of landscape and hardscape elements. 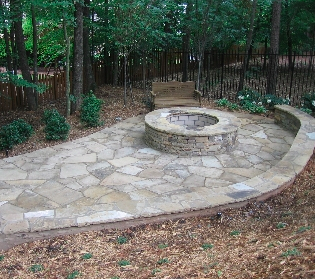 With the cooling weather, we tend to note an increase in the interest of outdoor fire pits. Fire pits serve as a great place for families and friends to make memories together. They also provide a fun and enjoyable backdrop for entertaining outdoors. Fall parties are absolutely lovely when you can take advantage of the crisp air and warm fire. Enjoy your own private fall festival with roasted marshmallows, backyard campouts, and ghost stories around your custom hardscaped fire pit. Contact Hutcheson today to get a free quote on a custom backyard fire pit for family memories to be captured around for years to come.